Posted on September 28, 2009	by Michael Gorton, Jr. I was finally getting to an appointment that I was suppose to visit in August, but as we all know too well, the summer sometimes get the best of us. I was finally able to set a date with Melissa Martin, Director of sales and Marketing at Raphael Vineyards and their Winemaker Richard Olsen-Harbich for some tastings and a tour of one of the premier wineries on Long Island. I was very excited about the visit, more on the visit at a later date, more on the wine. This is a wine I was eager to try for a number of reason, first it was from Raphael and second was how it was aged. Upon research, I found that it was aged in 100% stainless steel. I really had to stop and think about this. I was concerned about the longevity of this wine and how it would cellar. First a little history about aging wine in stainless steel. Most of your white wine and rose wine is aged in stainless steel. It is aged at a low temperature for a short time, a year maybe and allowed to ferment and grow. Some wines like Chardonnay is aged in oak barrels, this brings out some butter and toast flavors. Red wine is aged in oak to bring out some of the earthy woodsy flavors and aromas you find in your merlots, smooth out tannins and make it a well balanced wine. When you age something in stainless steel it tends not to have a shelf life, it is drinkable now, you only have a short period before the flavors, and aromas vanish. Another factor that had me scratching my head was the fact that some winemakers might use stainless on a lesser grape or maybe the quality is not where it should be. The oak barrels that the vineyards purchase are expensive and if the fruit is not up to their liking and standards why waste money in fermenting it in oak. That being said, you have heard me mention the banner year Long Island had for wine, the red fruit was at its top of the game, these are wines that will last a decade or longer in the cellar. So I could not wait to ask Rich Olsen-Harbich, why would you do such a thing like this to such a beautiful grape? Back to the wine, on the nose, I was getting some big bright Cherry and raspberry aromas along with blackberries and a touch of cranberry. This was a major fruit forward wine. The taste was where the fireworks were. I was getting a wonderful earthy, mineral flavor that was so intriguing; it was a little like water running over slate. I was getting some dried herbs and spices. There was a touch of currant and cranberry there on the palate. I was not getting too much of that fresh green I like in my cabernet franc. Now, the next day and the day after I tasted this wine again in the comfort of my home with my wife. In addition, everyday this just kept getting better and better. I was finally starting to get that fresh green on the end of the taste. It was a very nice and unusual Parsley flavor. I was also getting a little fresh string bean. This wine was truly blowing me away. The front of the wine was still very fruit forward. Showing more raspberry and blackberries tones. There was just a hint of floral on the nose too. Now, back to the stainless steel discussion. Because this was aged in stainless steel, this was a very fruit forward wine. I was not picking up any woody, cedar, and oak notes that you would typically see if it were aged in oak. According to Rich, this is a wine that should be done this way, when possible. This method is typical of Chinon in the Loire Valley. Stainless steel fermentation was done in separate stainless steel vats at 60 and 80 degrees and blended later on to bring a little complexity. This allows the grape and nothing but the grape to be the focal point of Cabernet Franc. By fermenting it in oak, some if not all of the green elements that are so familiar of Cabernet Franc are lost. I am in total agreement with Rich, here. He has converted me. Moreover, if you are unsure if you are a Cabernet Franc fan, this is a wine you can check out to see for yourself. It is approachable and affordable. It retails at Raphael for $15.99. The next time you see this, pick it up. If you can, decant this wine for about an hour before you serve this wine. You will love this wine and you will soon become a Franc Fanatic. 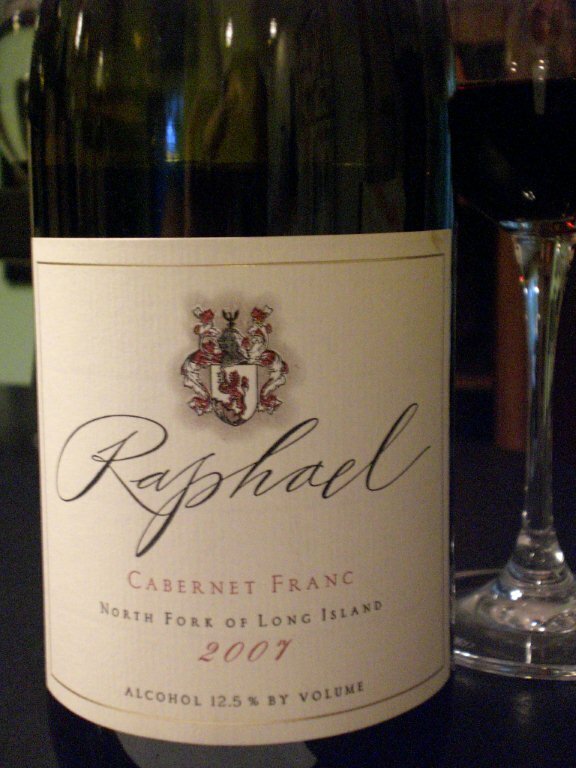 This entry was posted in Cabernet Franc, Long Island, Notes, Raphael, Winery Visit. Bookmark the permalink.